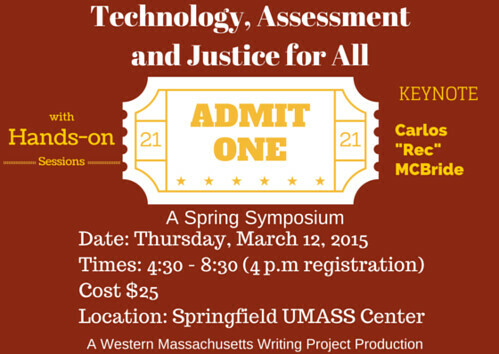 Next week, our Western Massachusetts Writing Project is hosting a Spring Symposium called “Technology, Assessment and Justice for All” and one of the opening events is a series of digital stations with student work (for example, I will have some student-created videos games up for folks to play). We also want to help teachers think about Twitter, and will have a “Post Your First Tweet” station set up, with our WMWP Twitter account ready to go. In thinking of how to help people see what Twitter is about, I decided to do an “anatomy of a tweet.” I’ve seen others do similar tutorials before, and I kept mine rather simple. We are also hoping that folks already on Twitter will use our hashtag (#wmwpsj) that night and we will be setting up a Twitter Fall of some sort. There’s still time to register, if you are in Western Massachusetts. I hope to see you (and tweet you) there! 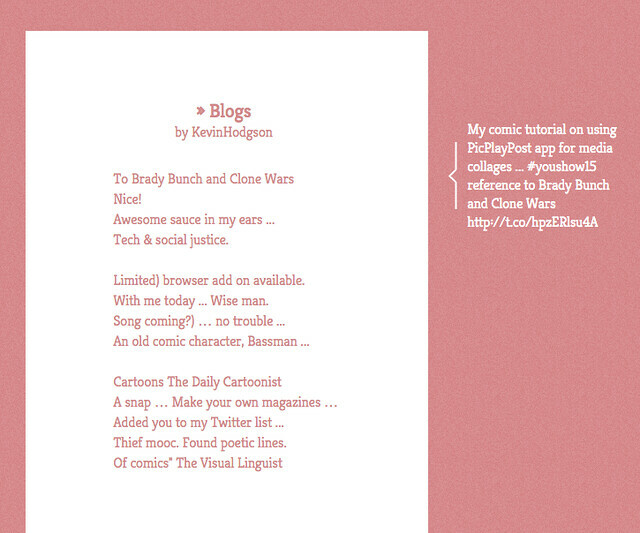 My friend, Janet, shared this interesting tool called Poetweet the other day. It takes your Twitter stream and based on your decision of the style you want (three choices), it creates a poem of sorts. What’s interesting is that the site also annotates the phrases with links back to the original tweet. Now I wish I had more wittier things in my Twitter stream … but that opening line — To Brady Bunch and Clone Wars … that’s a classic! And then reference towards the end to “found poetic lines”- that’s me, all right. The #TvsZ game ended last night, after a weekend of furious activity on all the teams involved to complete the final “mission” that pulled together all sorts of strands of stories, media and collaborative principles. Unfortunately, I was out of the house for much of the afternoon and left the curating of my team’s mission to others. 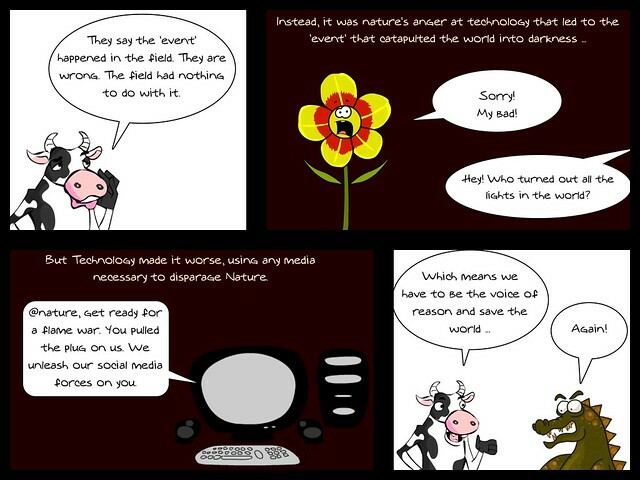 I did create a “myth” story for our team (#DragonBovines) as a comic, in hopes that I could at least contribute something. Others wrote myth tweets, too. The need for collaboration and team-building trumped mostly everything else. This is built into the dynamics and flow of the game itself, as you begin by recruiting for a team and then work forward from there. Much of the play was recruiting, resisting and helping teammates as membership shifted across the board. Some literacies that I noticed: writing in short-form, collaborative story writing, media awareness and media creation, hyperlinks as text, collaborative practice, rules negotiations, remixing content, and other skills that I am still mulling over. You don’t quite realize the extend of connections until you get a glimpse of something like the Tagsexplorer that was set up for the game. Check it out. That’s when you get to pull back and glimpse some of the writing and connecting that was going on, as all of those strands reach out and represent connections. Pretty amazing. And the tool is perfect for getting a real idea of activity in a game like this, which can often feel fleeting in the moment. I will be curious to see how the discussions unfold in the undergraduate classes that were playing the game across the world, and what the students saw in the game. One question should be: did playing TvsZ have value beyond just playing the game itself? 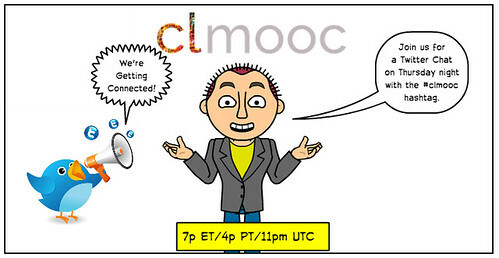 What was learned about the self and about connected learning practices? It may be a game, but TvsZ is always more than just a game. PS – here is a collection of comics from our team, as curated by NanaLou. What a mad rush of playing #TvsZ 6.0 yesterday … in between family time (shopping for shoes, raking leaves, etc. ), I popped into Twitter to play when I could as odd things unfolded, from a merging of teams (My team is now #DragonBovines) to multimedia creations, and some trash-talking as the main teams jostled for position in the literary landscape of the game (I hacked some photos last night with my cow character). We were writing poems, making videos and collaborating all day (although to be fair, I missed most of those activities … thankfully, other the other firecows had things under control). This morning, I got to thinking again (see yesterday’s post) about ways we could bring everyone together — to find ways to collaborate within the game framework instead of working against each other. I don’t know if this will work but I created this comic and put it into ThingLink, and opened it up for anyone to add tags on the Metaphorical Bridge to Survival. I am hoping players from all teams will tag the bridge. In game theory, the idea of dynamics is important. Change a variable in any game system, and the play changes along with it. You can make this theory visible for yourself by taking any familiar game, such as Chess or Monopoly, and adding or removing elements/pieces/rules. You quickly realize that while your knowledge of the game has some historic grounding, the changes now put into place add a wrinkle to the perception of play. The game becomes something new. Which leads me to a bit of a ramble … I am participating in the 6.0 version of TvsZ, or what was known in previous iterations as Twitter vs. Zombies. It’s being run by some very good friends of mine as an offshoot of Digital Writing Month and as part of the grad (I think) classes they are teaching. 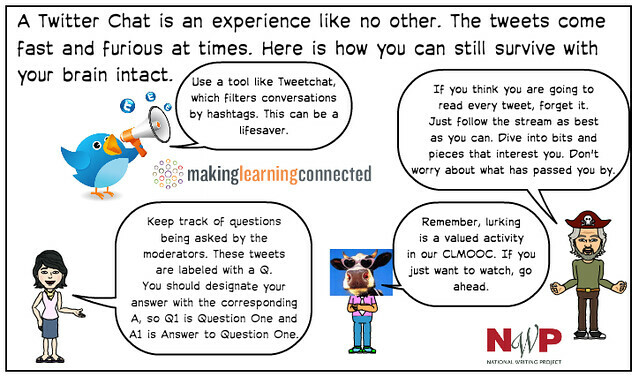 I find that fascinating, extending the learning about literacy in the classroom to something like a Twitter-based game. Now, this particular TvsZ is not Twitter vs Zombies, as the organizers were wary of having fun with zombies in a time when Ebola and other epidemic crisis flash points face the global community. Instead, the narrative of this Twitter game (yes, it all played on Twitter, with hashtags and alliances and media and more) is about finding a community aligned with either Technology or Nature to survive an apocalyptic moment in time, where you need to determine what is important and what is not. The game rules allows you to #recruit others and fend off recruitment. It’s a bit difficult to explain here and you might be shaking your head. The game started mid-day yesterday and continues through the weekend. I popped in when I could during teaching breaks. 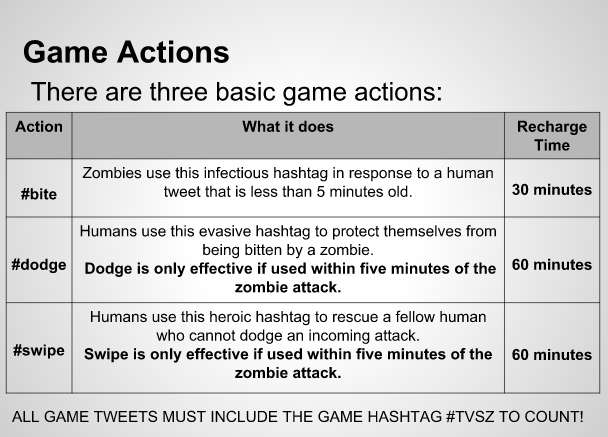 As I played TvsZ here and there during the day and into the night, some trends I noticed had me thinking about past variations (see a past reflection on why I played Twitter vs. Zombies) and the updates now embedded in this version. Here, then, are a few unfocused observations …. I admit, I was confused at first about the team concept, but then I aligned myself with Team Technology. I thought, all these young people will want the Technology over Nature. (I was also confused because an earlier version was Zen, not Nature, but I think the organizers went with Nature so as to not confuse students who are playing with philosophical concepts that would draw away from the game … maybe … I am not sure). 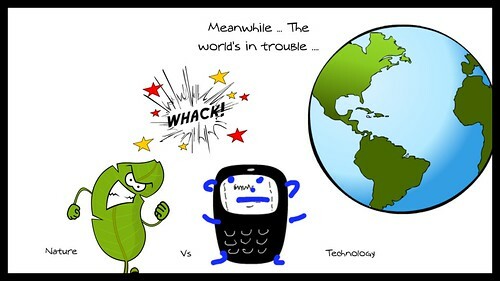 So I thought the pendulum would swing to Tech. Wrong. Very wrong. For much of the afternoon, I seemed like one of the lonely technology beacons in the game, and then got recruited in a mad rush to Nature by a bunch of players. I could not defend myself and switched teams. Reading the tweets of the players on Team Nature, and realizing of course that it is a game, I could not help but think of the game as a way to push back on the intrusion of technology in our lives. I mean, the numbers even this morning remain overwhelmingly against technology in this game. It’s fascinating, particularly if it is a cultural criticism of our lives becoming digital and a yearning to break free of it now and then. Maybe the game has given some people a chance to express that contradiction (ie, they are playing a game on Twitter while renouncing technology). In previous versions of the game, the narrative arc of the game was clear. The zombies are out to get you, and you better use all of the rules of the game to remain human. Or if you become a zombie, become relentless and get the hoomans. I’m not a zombie-literature fan, and find zombie stories rather boring. I never got into The Walking Dead. But I enjoyed the dichotomy and simplicity of the game. You were human or you were zombie. Zombies (antagonists) chased humans (protagonist) and humans banded together to thwart zombies. This is not a criticism of the architects of this 6.0 version, but I am feeling a little lost in the survival narrative of the game right now. It seems like teams are out to disparage other teams to shift the power balance by increasing recruitment. I get that. But unlike previous version, I am not sure where that is taking us. (I am hoping there are grand plans afoot to make it clearer.) I was happy to see a new mission on “food” this morning. Related to that last point, I began to feel during the course of the day that there should be more ways to bring the groups together. It’s a survival story, right? It does not have to be a zero sum game (ie, you perish so that I can survive, or vice versa). I began to wonder if there were collaborative points that could be inserted into the game narrative, as a break to bring people together, no matter the affiliation. That led first to me creating a collaborative poem space — a #hidingspot — where folks on any team could write together. I also suggested a possible rule called #danceparty, in which if someone shares a technology- or nature-themed music video, the game stops and becomes a global dance party for five minutes. Imagine that? Yeah. I’ll be thinking more of ways to bring the game’s players together instead of pushing them apart. We’re all hooomans, after all. It’s been intriguing to watch other groups emerge, too. Along with Tech and Nature, some groups of students created Dragon and Fish teams. And then last night, a friend with #ds106 connections created the Bovine team, and I was happily recruited. I wonder how this splintering of teams affects the overall narrative. Hacking games is a way to gain agency in the system, and I am curious to know how it will start to come together and make sense on a larger scale. I understand the smaller scale of the game. I want to see the larger picture. I appreciated, too, that the organizers have opened up the Rules Document and allowed players to suggest rules for play, providing a space for anyone to get involved in how the game will unfold. We are not shackled by one vision of the game, although someone will become arbiters of the rules in the end. This is how digital writing plays a role here. I could write to the makers of Monopoly, and make suggestions, but what are the chances my words and ideas would be read and used? Unlikely. I know my suggestions in #TvsZ will be read and maybe included. Even if a rule change is not implemented, I feel empowered by the process. And that happens because of a click of a switch that makes a closed document an open document. That’s a powerful example of collaboration. Finally, a huge hats off to the game’s organizers for exploring this kind of Twitter-based game for learning with their students. In the past, I’ve wondered how I could adapt Twitter vs. Zombies for my sixth grade classroom, and came up empty. I think this shift in the rules might be a way for me to revisit the idea, if I can find a solid “hook” to the narrative for my students … or maybe a more solidified goal for how the game ends (do we all become one large community again? do we defeat the darkness with a blast of light? do we build a spaceship and head off into the sky?) I will keep looking to the game unfolding this weekend as a possible model for how it make work. Yesterday, in the Twitter-based tag game of Twitter vs. Zombies (aka, #TvsZ), I was a “human” for only a short time in the morning, then got hit with a #bite that turned me into a zombie. Apparently, being up early, as I often am, was a huge disadvantage because I had no other human friends around because no one could #swipe me and protect me. I become a zombie. As a huge, shifting game of Internet tag, Twitter vs. Zombies is intriguing on many levels, and I have written about this before. But this time, I tried paying attention to how the change in the rules impact the game. Adding elements changed game dynamics every time, and that was important. We all needed something new to hang on, to know that the game would not be static (so, hats off to the organizers). During the day, I made comics, memes and even hacked the Twitters vs. Zombie website with xRay Goggles, as way to bring some media fun into the mix and add some different literacies into the game. One of the rules of the day involved sharing images, too, to either add a #bite if you were a zombie or find shelter if you were a human. 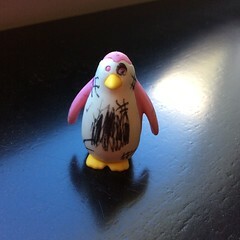 I ended up using this penguin that my son had turned into a zombie of sorts, posing it throughout the house during the day as my way to get #xtrabite power. 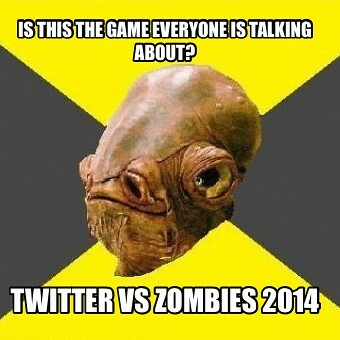 Today marks the first day of another round of Twitter-based Twitter vs. Zombies. It’s a crazy game of hashtags and 140-character moves and, well, it’s a bit difficult to explain but that’s no reason you should not come into the game, too (Me? Not a huge Zombie fan. But I find this game of TvsZ fascinating). 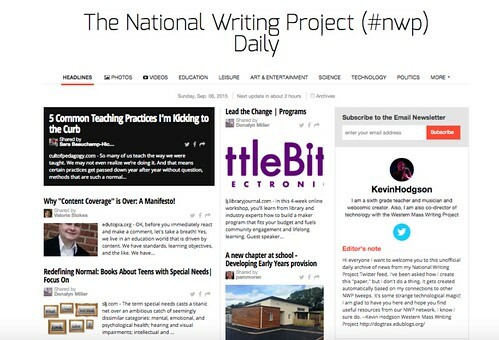 Finally, read through this great piece about why TvsZ matters when it comes to digital literacies and multi-platform, collaborative writing. 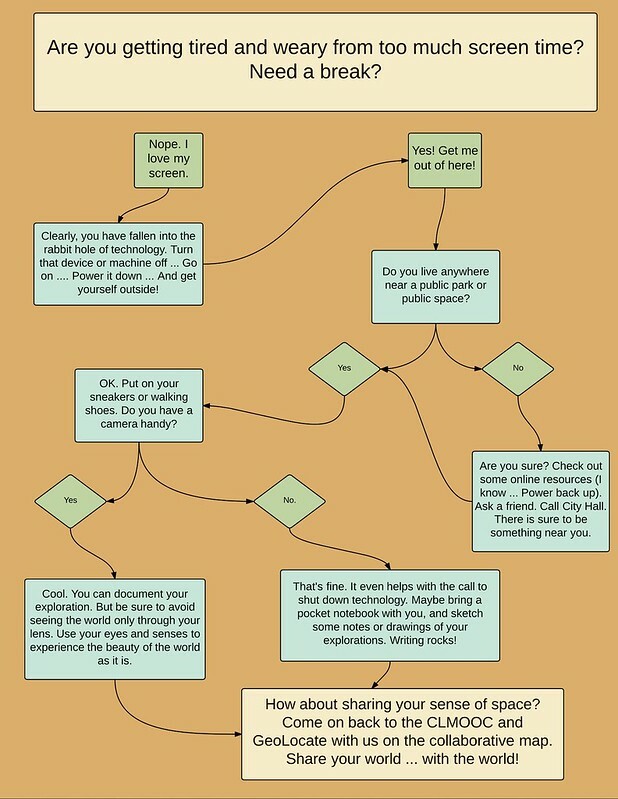 I still struggle with: How can I design a version of this for my students?